Glenavon midfielder Sammy Clingan brought his goal tally to the season for six with his two late penalty kicks against Glentoran, but he was quick to praise his side’s character to bounce back from conceding an early goal. 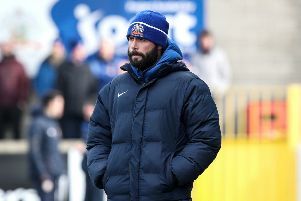 “I think we showed great character to equalise just after Glentoran had taken the lead,” he said. “We certainly deserved to be going in at half time level . . . in fact, we probably could have been in front. “To be fair to Glentoran, they came out for the second half and put us under a bit of pressure. We had to get in a few decent blocks on shotts and Johnny Tuffey had to make a good save from Allen. “We are on a good run at the minute, so we are delighted with the three points. “It was important we clawed a few back on Coleraine. I know there is a long way to go, but we can’t affords to let them sail away form us. “They are the team we are all looking up to at the minute. They are running away at the to, so it’s important to stay on their tails. “Elliott Morris was certainly the busier of the two goalkeepers. We knew the Glens would made it difficult for us. They drew with us earlier in the season. Glentoran boss Gary Haveron believed his team deserved better on the night. “They (Glenavon) must have made about 12 last ditch tackles to save certain situations when we were bearing down on goal. “We certainly take the chances that came our way which would have reflected on how well we were playing. We were knocking the ball about well . . . we were getting in behind them on numerous occasions. “Then we gave away two penalties which was criminal. It was farcial. I think think that Andy Davy had a particularly good game -- and I mean for both sides. “The people on their bench were calling him for everything for the first 20 minutes and the fourth official didn’t do a thing about it. “There were nine bookings, which sums it up. “That’s not an excuse. We needed to be more clinical in front of goal. “We played much better football than Glenavon. They were pinning on big long diagonal balls and hoping for a knock down from them. “It’s difficult to deal with. But we brought all the trouble on to ourselves.